Daily Supergreens powder is a highly nutrient dense superfood powder with alkalizing properties, and is packed with antioxidants, essential phytonutrients, and fiber. 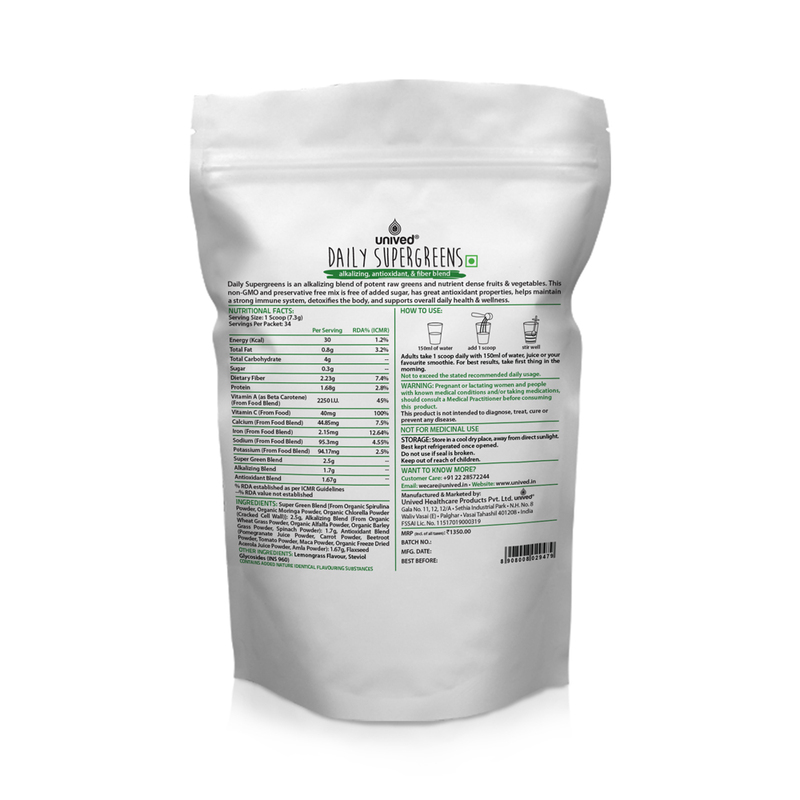 We’ve included alkalizing foods like organic wheat grass, organic barley grass, super greens like organic spirulina, organic moringa, and antioxidants like maca, acelora, amla, along with flaxseeds. With Unived’s Daily Supergreens powder you save time and get your days green nutrition that helps you detoxify and alkalize your system, restore your pH balance, and remove harmful toxins. And, it tastes great! Non-GMO, soy-free, sugar-free, and no preservatives. 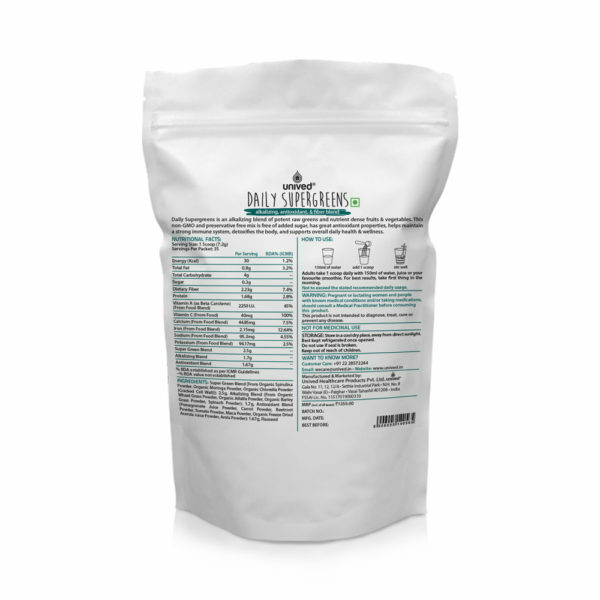 Daily Supergreens powder is made with non-GMO ingredients and zero preservatives. 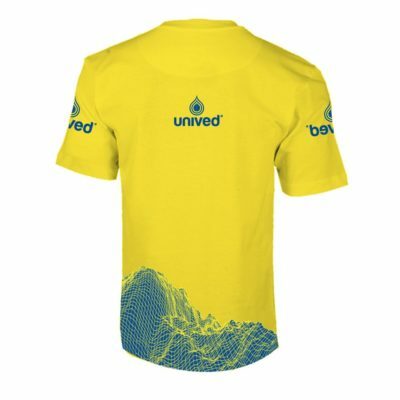 The product is 100% vegan and gluten-free. There is absolutely no sugar added making it diabetic friendly. Worshiped by the Egyptians for its positive health benefits, wheatgrass is one of the most powerful green vegetables available. Wheatgrass is abundant in natural vitamins, minerals, amino acids, and enzymes. It aids in restoring vitality and cleansing the body, as well as boosting immunity. Alfalfa’s ability to absorb minerals and nutrients is due to its deep roots. 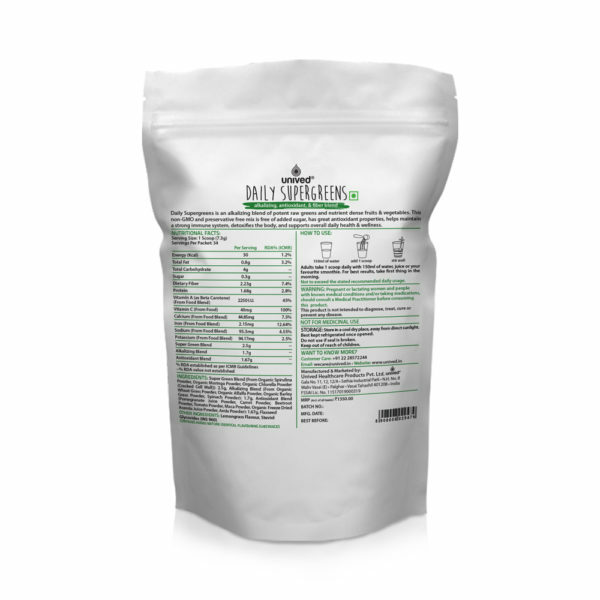 It contains amino acids, vitamin B12, fluoride, and chlorophyll. Barley grass leafs are abundant in enzymes. 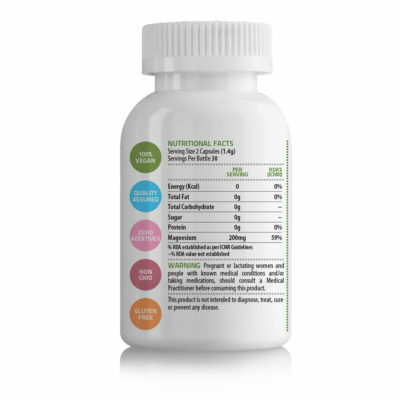 Enzymes essential in our bodies digestive processes, provide cellular energy, and have antioxidant properties. Spinach is packed with a plethora of nutritional properties which help strengthen our immune system, boost energy levels and provide the body iron, magnesium, calcium vitamin K, vitamin e and many other minerals and vitamins. Discovered by in Central America by the Aztecs, Spirulina is a blue-green algae rich in chlorophyll, protein, beta-carotene, and the fatty acid gamma-linolenic acid (GLA). 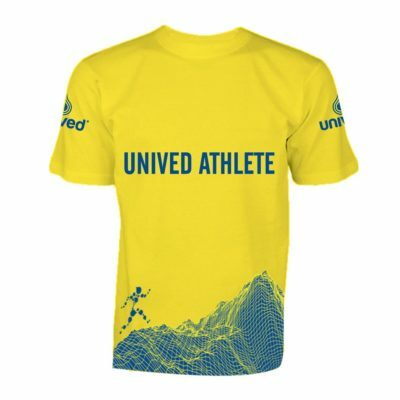 Its vital nutrients provide strength and energy. Chlorella is abundant in chlorophyll and nucleic acids. There is actually no other food that has more chlorophyll than chlorella. It’s tough outer cell wall helps bind with heavy metals, pesticides, and other carcinogens and carry them safely out of the body. Known as the “Queen of Greens”, Moringa is a rich source of vitamin A, B, C, D, E and K, calcium, potassium, and other essential nutrients. Rich in antioxidants, pomegranates are a good source of vitamin A, vitamin C, and vitamin E, as well as folic acid. Carrots are an excellent source of vitamin A from Beta Carotene. Abundant source of carotenoids which Support optimum Health. Beets are also high in folate and manganese. Tomatoes have a wealth of nutrients and vitamins with significant amounts of lycopene, vitamin A, vitamin C, and vitamin K. They are also a good source of potassium, manganese, magnesium, phosphorous and copper. Native to Peru, maca is rich in calcium, magnesium, phosphorous, and iron. 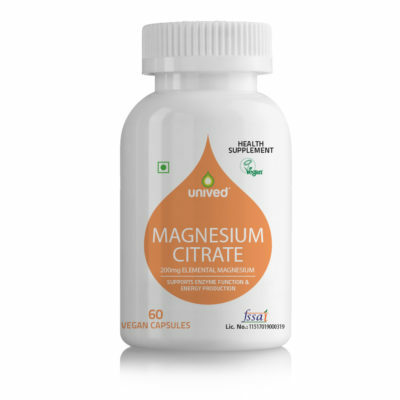 It also contains trace minerals, including, zinc, iodine, copper, selenium, bismuth, manganese and silica, as well as B vitamins. Acerola is nature’s richest source of vitamin C. Vitamin C is a powerful antioxidant important for overall health and immunity. A native to India, Amla is used in Ayurveda treatment. It is rich in vitamin C, and contains minerals and vitamins like calcium, phosphorus, iron, carotene and vitamin B complex. Amla is an antioxidant powerhouse. Rich in omega-3 ALA, flaxseeds also provide antioxidant properties and both soluble and insoluble fiber, which aid cleansing and keep a happy digestive system. 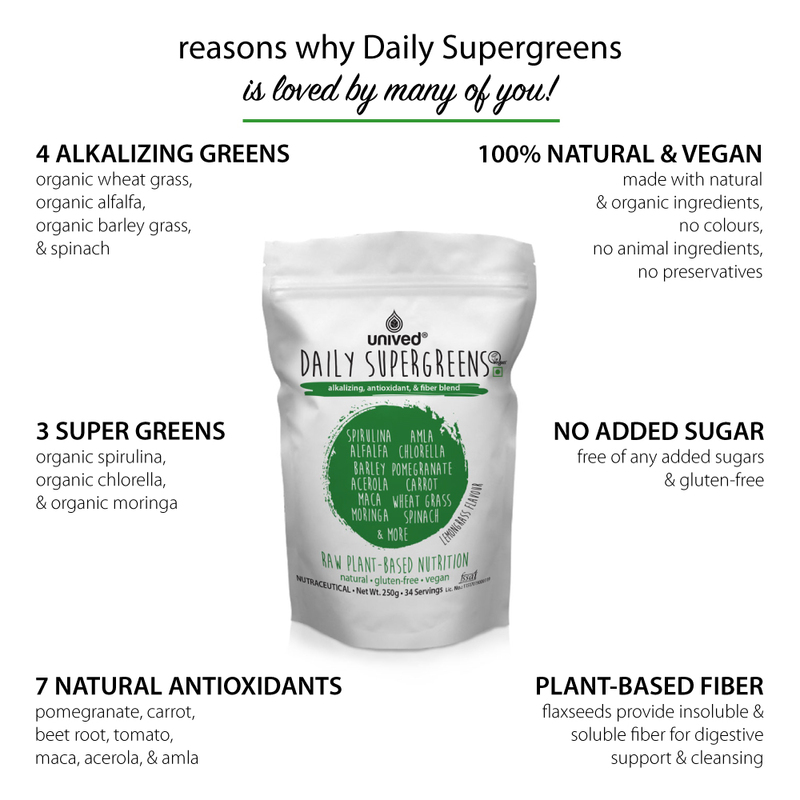 Who should use Daily Supergreens Powder? 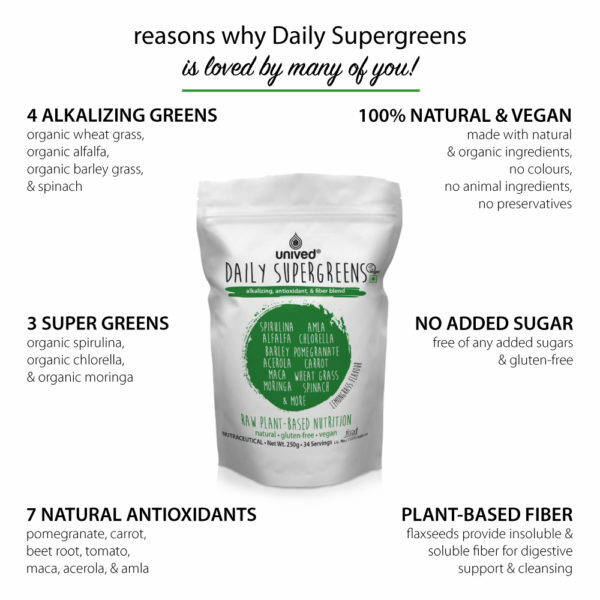 If you are busy and don’t find the time to get in your fruits & veggies – then Daily Supergreens powder is perfect for you. A single serving a day will help you get closer to your daily nutrient, antioxidant, minerals, fiber, and vitamin requirements. Though it is not only for busy bees, and anyone looking to boost their overall well-being, boost energy levels and improve vitality can incorporate it into their daily health regimen. 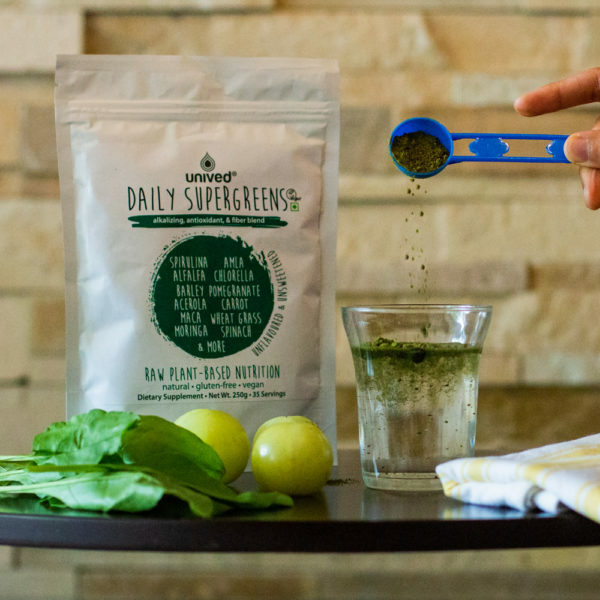 We recommend consuming Daily Supergreens powder first thing in the morning to start your day. However, it can be consumed anytime during the day. If you have any questions, allergies, or concerns before consuming, we recommend consulting your registered dietitian or healthcare professional. 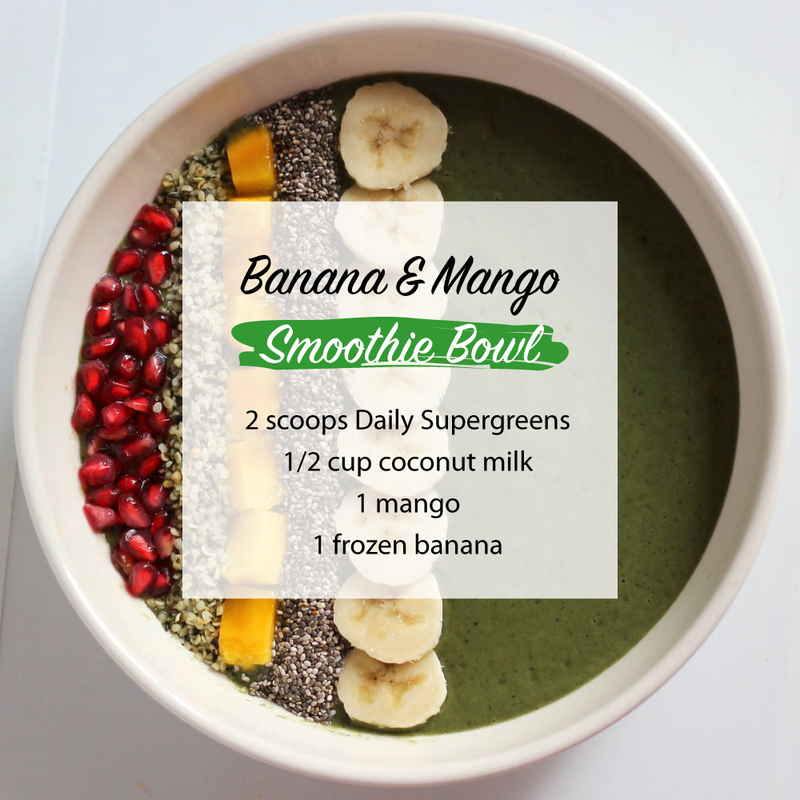 Add 1 scoop (7.3g) of Daily Supergreens powder to 5 oz (150 ml) of water, a non-acidic juice or your favorite smoothie! Can I add Daily Supergreens to my smoothies? Yes. Daily Supergreens can be added to smoothies. Can I consume Daily Supergreens with coffee or tea? We recommend consuming Daily Supergreens on an empty stomach first thing in the morning. This will help the body absorb the nutrients better. One should allow at least 30 mins to an hour before having coffee or tea after consuming Daily Supergreens. When should I take Daily Supergreens? It is recommended to consume Daily Supergreens in the morning before eating anything else for optimal absorption. You can also take Daily Supergreens throughout the day. 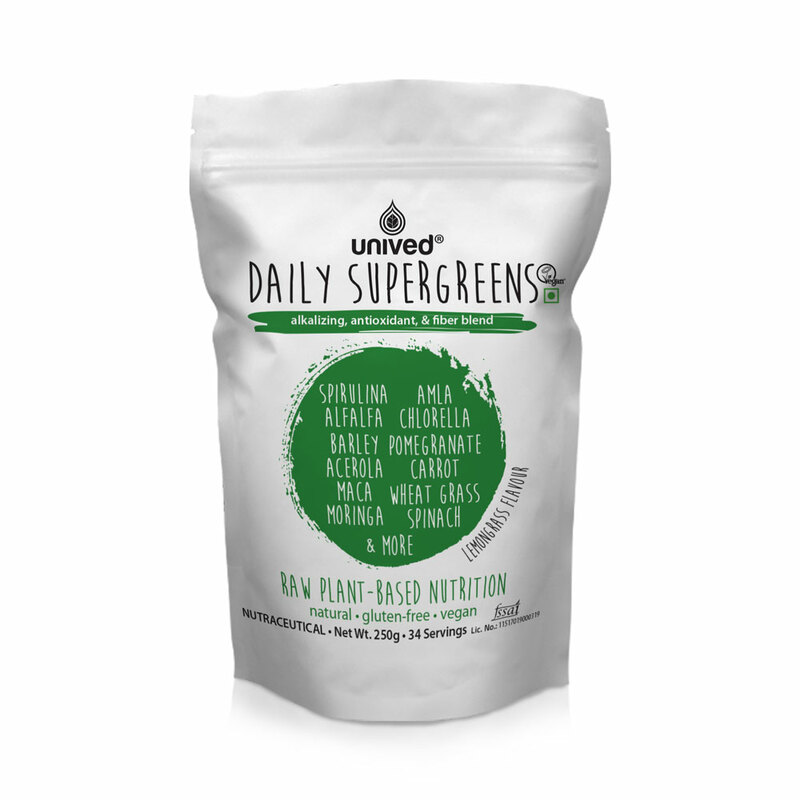 Can I can drink Daily Supergreens with Unived’s Coconut Vinegar? Yes, you can drink Daily Supergreens with our Coconut Vinegar. 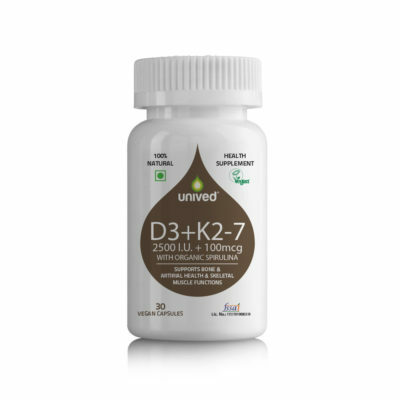 D3+K2 is are formulated with 2500 I.U. of vitamin D3 as Cholecalciferol, 100mcg of vitamin K2-7 as MK-7, and organic spirulina. It is a 100% vegan and natural. 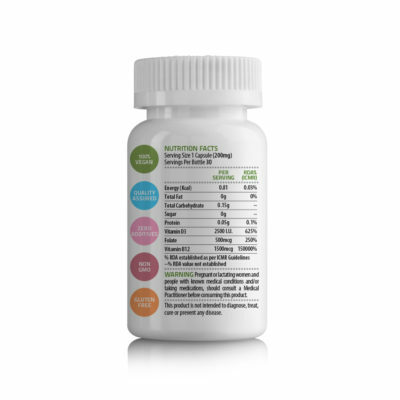 It supports calcium absorptions and utilisation, cardiovascular health, and immune health. D3+K2 is suitable for vegans.